Dr Samantha Murray, of Macquarie University in Sydney, says some of the things that some people don't want to hear. In her book, The 'Fat' Female Body, Sam offers a critique of fatphobia within the health professions, a phenomenon that many of us know well, and she goes on to discuss the ambivalence that many of us experience around our own fat embodiment. But it is her criticisms of some kinds of fat activism that are the most timely, in my opinion, and Sam's discussion brings in ideas about ideology and social change in a manner that is both adult and brave. Being the person who pipes up about difficult things can be a thankless task, especially when those criticisms are set within a context where people already feel beleaguered and powerless (though let's remember that many of us are not necessarily either of these). But it is my belief that the protagonists of any social movement, fat included, can benefit from a degree of critical self-reflection, and Sam's work is vital in this respect, it helps us to grow. Like Sam, I am interested in social change that is expansive and complicated, that dares to look at the hard stuff. Could you talk about some of the critical work around fat that's coming out of Australia? I'm aware of Jan Wright, Michael Gard and Lily O'Hara but am pretty ignorant about the scene in general. Is there a history of fat activism in the country? Or in Sydney? In Australia, there is a growing contingent of us working on fat studies, with lots of really exciting work coming out all the time. There is lots of innovative doctoral research in progress here at the moment – for example, people like Rachel Kendrick and Jackie Wykes. Michael Gard and Jan Wright’s work, which you mention, is fantastic and probably the best-known critical work out of Australia. Jan Wright is also the founder of ICONet (International Critical Obesity Scholars Network), which draws on a range of disciplinary approaches, and encompasses research by scholars all critical of the alleged ‘obesity epidemic’. In terms of fat activism, there is a growing scene, but not on the same scale as somewhere like the US. We have a really exciting online activist presence with some great blogs, such as Bri King’s Fat Lot of Good, and the fabulous Fatadelic. There is a strong queer community commitment to fat activism and critique of the construction of fatness in the West. Some of this critical commentary and activism was recently profiled in Cherrie magazine. My current thinking is that weight loss surgery (WLS) is problematic in many ways, for example I think it supports beliefs about the worthlessness of fat, it destroys people's health, and it profits from lies and misery. It is for these reasons that I doubt that I would ever choose surgery for myself, along with the facts that I don't value slenderness that much, I'm not interested in assimilating into normative-sized society, and generally I consider it a bad move. But I also see that many fat people are choosing such surgeries. I suspect that 'choice' is moot since fat people are under phenomenal social, medical and commercial pressure to lose weight at any cost, and I know that these surgeries are being promoted without fully informed consent. Yet I'm interested in fat people's agency and in the feminist principles of ownership and control of one's body. Could weight loss surgery ever be a part of that? Maybe it is already, and that the problematic aspects of it are part of its contingency and complexity? I'm thinking of how some transgendered people approach surgery in progressive ways, I keep coming back to trans-theorist Kate Bornstein's badge slogan: Biology Is Not Destiny. Is weight loss surgery like gender reassignment surgery? The latter has also been critiqued as mutilation and misogyny. I’m very reluctant to situate my own experiences with WLS as an empowered choice about taking control of my body. The notion of a ‘journey’ that is so often deployed in weight loss narratives, particularly on reality TV shows I think (problematically) implies a defined end point where the ‘journey’ ends and one is ‘re-made’ as a kind of ‘successful’ body project. My own experiences of WLS don’t mesh with this idea at all. For me, the initial consultation, the illness, the agonizing decision, the surgery and the ongoing daily management of my post-WLS embodiment didn’t (and don’t) play out along the lines of feminist empowerment at all. The decision to have the surgery didn’t feel like a choice to me, for a variety of reasons: in amongst the rhetoric of the numerous stakeholders fat people are all too familiar with navigating all the time, I tried desperately to disavow the illnesses that precipitated the recommendation for the surgery as all too conveniently related to ‘obesity’. However, this was all set against my own personal experience of pain and illness, The decision to undergo the surgery was politically torturous: I did not want to reaffirm the medico-moral panic about obesity by submitting to what I had imagined as its most drastic and violent intervention. And co-extensively, I did not want to compromise my own fat politics and my activist community (despite my struggles with certain models of fat activism) by agreeing to this surgical procedure. This constant vascillation was miles more painful than the surgery and the recovery itself. I'm interested (and often appalled) in the relationship between fat activism and weight loss surgery. There is a fear that fat people are going to be annihilated through surgery and that people who have it are colluding with an enemy. I have seen fat people who have supported activist communities for years lose status and membership after having surgery, and I have been in activist spaces where the issue of surgery is so vexed that there is a kind of censorship going on an no one is allowed to say anything about it, especially anything positive. I experience this as shaming, shunning, shutting down and silencing, and it pisses me off! What are your thoughts about how the fat liberation movement should move forwards? Regarding the tensions I’ve outlined here as productive rather than as problems to be definitively solved increasingly seems enabling to me, as all my work has been underpinned by what I regard as pretty fundamental to all of us: ambivalence, ambiguity and multiplicity. 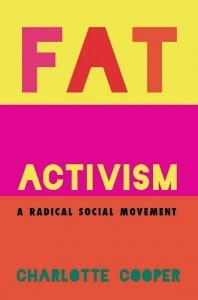 I do think that fat activism does need to make a space for critical voices that trouble our own experiences of fatness in the same way we trouble dominant popular, moral and medical responses to, and constructions of, fatness. In fact, I think this is a necessary task in order to continue to make visible and address fatphobia. Unfortunately, even though I am, and will always remain, utterly committed to fat politics (and a lifelong fat grrl – after all, medicine still classifies me as ‘overweight’! ), my WLS has been received with some hostility and judgment by some in the fat activist community. While I understood this hostility (I had internalized my own political hostility to WLS in the lead-up to the surgery), I was deeply saddened by the limits that are often so evident to me in the prescriptive ways of ‘doing’ some kinds of fat activism. Your book charts your disillusionment and disappointment in some areas of activism, but I wonder are there trends and themes within the movement that give you hope or inspire you at all? I should say, in one of your blog posts, you note that I suggest activism is part of a liberal humanist framework that ignores the inescapable nature of people's specific circumstances. 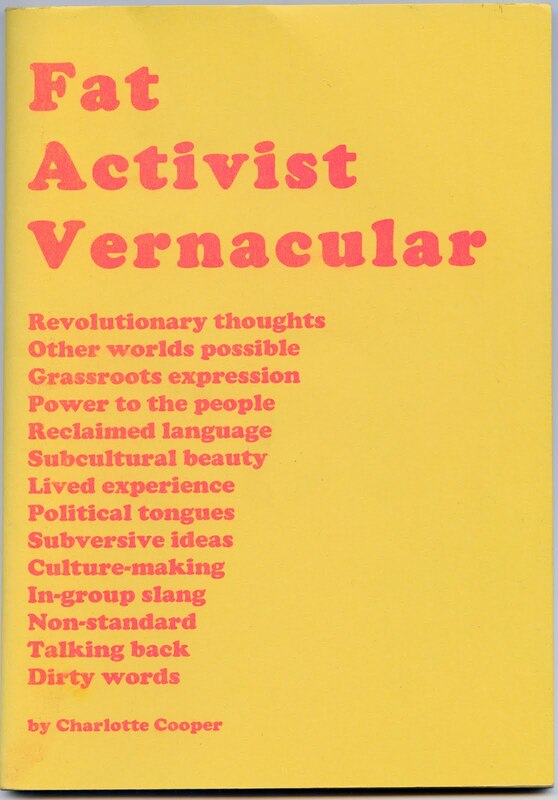 This implies that I think activism is impossible and a futile project. I just want to say that I don't think this is the case at all, and was not what I was indeed trying to say. Rather, dominant models of organized fat activism, particularly in the States, often support a singular political identity. While this is often strategic, in terms of lived experience, it precludes and occludes a multitude of voices, experiences and differences. Activism that makes a space for a critical space animated by these competing, ambiguous, multiple and contingent narratives (and I certainly believe this activism does exist and is possible) is the activism I think is vital, crucial and most productive. I have always considered myself an activist: just an activist who wants to ask difficult questions about some quarters of activism, often questions just as maddening and difficult as the social situation that gives rise to our ire. My approach to fat activism is informed by critical medical studies and feminist philosophy of the body. I critique dominant models of identity politics because there can be a danger of slippage into prescriptive requirements of bodies and selves that end up recuperating the very normative body aesthetics that we oppose. However, I also accept that identity politics can be (and often needs to be) strategic for political expediency. I guess all my work is undergirded by an absolute rejection of absolutes and binary modes of thinking, especially in terms of 'right'/'wrong' moralism. Having said that, I am aware that while there are dominant models of fat activism that are guided by traditional identity politics, fundamentally, fat politics is an ever-shifting vanguard, lived out across a myriad of different approaches, embodiments and interventions. This is what inspires me: the possibility of different narratives and of having conversations that are as productive as they are difficult. From my own perspective, the work that is most effective/affective is work that is visceral, that is embodied, and that makes people uncomfortable in productive and enabling ways. And I think that this is what the most exciting, provocative and innovative fat activism does. That kind of activism that queers ‘fatness’ by simultaneously asking us to think about the strangeness of what we understand as ‘fat’ and how that fatness is also empowering - particularly when we use ‘fatness’ as an activism that defamilarises and threatens dominant constructions of ‘obesity’. To me, I think that ‘doing’ fat, in all its complexities and ambivalences, is what is exciting, rather than ‘being’ a fat identity. Since publishing the book, my research has moved into what a much more critical medical studies/critical fat studies concentration and research into the panic around childhood obesity, and bariatric (weight loss) surgeries are the focus of my current work. I’ve just finished co-editing a book collection with Nikki Sullivan called Somatechnics: Queering the Technologisation of Bodies and Selves, which is due out with Ashgate later this year, and includes a chapter I wrote critically reflecting on my experience of fatness and post-WLS embodiment. As a WLS patient and an academic who writes on fat embodiment, I dwell at the intersection of some difficult and disturbing tensions: the role bariatric surgery plays in perpetuating certain cultural understandings of fatness as a kind of empirically monolithic clinical marker, the commodification of bariatric procedures, and the very real and oft hidden realities of living with the band post-operatively, alongside the political implications of WLS and considering the space that needs to be made for different body narratives/activism in fat politics. There’s so much more I would like to say! What I mostly want to say is that I’m all about starting a conversation that is not simply about extracting a justification from people or reducing debate to picking a side – and what I have found most frustrating is that when I have tried to do this in some fat activist fora, I’ve been shut down, dismissed or just regarded as a suspicious traitor. I really hope people will want to start a conversation with me - I would love to hear from anyone who wants to talk about these issues. Let’s start a dialogue! That's fascinating, and it makes me want to read The 'Fat' Female Body. The way you posed your initial question about WLS, Charlotte, articulates so much that I feel, think, observe and wonder about it, and that phenomenom of the pain(s) of addressing -- what? -- the political tensions, internal and external, around a decision to have the surgery is a big, real, very present pain, along with the other aspects of the surgery, however the individual involved experiences them. I find that I barely have language for a response, which makes me more grateful for the discussion here. And, then, I find myself with a kind of old school resistance to the idea of doing fat rather than being fat, even though I know that what fat is and means changes so much with context. I rubbed my belly for a moment here before I started typing again. One of my kind of baseline experiences and strategies about fatness is that it is the very compelling tactile experience -- the softness, the motion, involving so many of the senses, really, which make it a powerful resources, even more present in the lives of fat people than fat hatred, if we can keep following our senses back to a direct experience of it. (Illness and aging complicate that, for sure, says me, and not in any proscribed quantity; I don't think more is better than less, or the opposite.) I just think that fatness as part of a body is a rich source of sensory experience. And, for me, an important part of that is that it just is -- that it's there, of me, as me, shifting, changeable, but there, here, so far, no matter what else is is happpening. It's that separation, so important to me in first coming to critical ideas about fat, that it's a powerful thing to tease out being fat from behavior like how much a person eats or moves. Anyway, interesting, useful, stimulating things to think about. I think the temptation to situate WLS as a bad choice doesn't really address why people have it, and I'm interested in why people would have it, I think people choose it for complicated reasons, and I oppose the shaming of people who have had it. It's hard to talk about, but not impossible, and I'm grateful for Sam's openness here about her own experiences. I'm not sure what you're saying in this second paragraph, something about subjective fat embodiment? About the flesh? Could you clarify a little please? Hi, Charlotte. I agree with what you say in the first paragraph of your comment, all of it. I don't think I've got anything more clarifying for the second paragraph. It's just me noticing that I resist the idea of "doing fat" rather than "being fat," and groping around for why I feel that way. Ok, I'll go back and re-read and try and get a feel for it. There is a growing Australian online presence in the fatosphere. I addition to Fat Lot of Good and Fatadelic (who hasn't been posting much lately...), there's Axis of Fat (http://www.axisoffat.com/), Random Quorum (http://randomquorum.wordpress.com/) and my blog, Corpulent (http://corpulent.wordpress.com/). Fat acceptance and fatshion is starting to get a bit more coverage in our media, too, so it's starting to be quite exciting for us over here.